Investigation of the incidence and distribution of congenital structural cardiac malformations among the offspring of mothers with diabetes type 1 and of the influence of periconceptional glycemic control. Multicenter retrospective clinical study, literature review, and meta-analysis. The incidence and pattern of congenital heart disease in the own study population and in the literature on the offspring of type 1 diabetic mothers were compared with the incidence and spectrum of the various cardiovascular defects in the offspring of nondiabetic mothers as registered by EUROCAT Northern Netherlands. Medical records were, in addition, reviewed for HbA1c during the 1st trimester. The distribution of congenital heart anomalies in the own diabetic study population was in accordance with the distribution encountered in the literature. This distribution differed considerably from that in the nondiabetic population. Approximately half the cardiovascular defects were conotruncal anomalies. The authors’ study demonstrated a remarkable increase in the likelihood of visceral heterotaxia and variants of single ventricle among these patients. As expected, elevated HbA1c values during the 1st trimester were associated with offspring fetal cardiovascular defects. This study shows an increased likelihood of specific heart anomalies, namely transposition of the great arteries, persistent truncus arteriosus, visceral heterotaxia and single ventricle, among offspring of diabetic mothers. This suggests a profound teratogenic effect at a very early stage in cardiogenesis. The study emphasizes the frequency with which the offspring of diabetes-complicated pregnancies suffer from complex forms of congenital heart disease. Pregnancies with poor 1st-trimester glycemic control are more prone to the presence of fetal heart disease. Untersuchung von Inzidenz und Verteilung angeborener Herzfehlbildungen bei Kindern von Müttern mit Diabetes mellitus Typ 1 sowie des Einflusses der Glucosewerte der Mutter in der Konzeptionsphase. Retrospektive, klinische Multicenterstudie, Literaturübersicht und Metaanalyse. Die Inzidenz und Art der Herzfehlbildungen bei Kindern von Müttern mit Typ-1-Diabetes in der eigenen Patientengruppe und in der Literatur wurden mit der Inzidenz und Art verschiedener kardiovaskulärer Defekte bei Nachkommen nichtdiabetischer, via EUROCAT Northern Netherlands registrierter Mütter verglichen. Zudem wurden die HbA1C-Werte im 1. Schwangerschaftstrimester analysiert. Die Rate angeborener Herzfehlbildungen in der eigenen diabetischen Studienpopulation war vergleichbar mit jener in der Literatur. Die Häufigkeit unterschied sich deutlich von der nichtdiabetischen Gruppe. Ungefähr die Hälfte der verschiedenen kardiovaskulären Defekte waren konotrunkale Fehlbildungen. 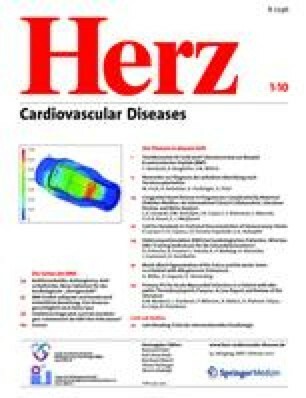 Die Studie der Autoren zeigte eine bemerkenswerte Zunahme der Wahrscheinlichkeit für viszerale Heterotaxie und Variationen eines singulären Ventrikels in dieser Patientengruppe. Erwartungsgemäß korrelierten erhöhte HbA1c-Werte im 1. Schwangerschaftstrimester mit erhöhter Inzidenz für verschiedene kardiovaskuläre Defekte.